To understand Barcelona we need to read past the municipality scale delimited by the massive ring structure surrounding it, but also past the metropolitan area, that expands behind the Serra de Collserola into the Vallès. Barcelona must be understood as a territorial coastal agglomeration that funnels urban density and activity towards the sea. Barcelona is better understood when read as a collection of urban areas gathered along the coastline of Catalonia, and urban densities that expand perpendicularly across the city and the mountains. 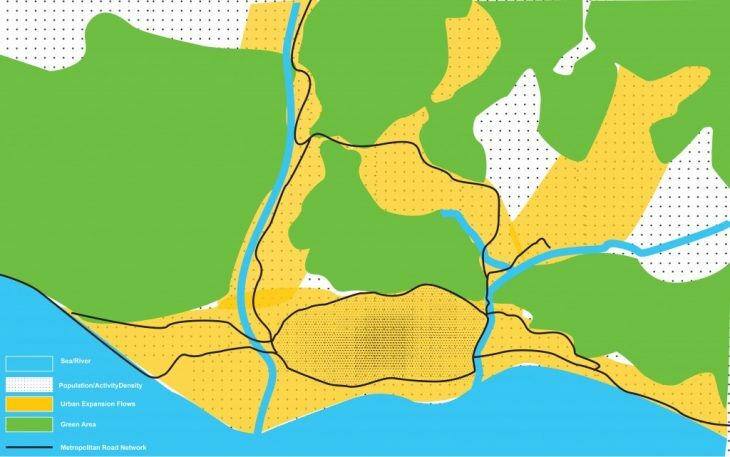 To strengthen the connection within this linear coast line, we must analyse the infrastructure parallel to the sea and its functions. La Ronda Litoral is the most important coastal road. Breaking its radial nature to extend it along the coast past the Llobregat and the Besòs rivers is our main point of focus in this workshop. Our strategy is to break the circular infrastructure of Les Rondes by transforming the curved edges of the ring into regular roads along the rivers and extend the Ronda Litoral along the coastline. In parallel, we should not neglect an important road grid aspect that the city is designed upon and should find a way to connect them as secondary roads to the main waterfront highway. Using the footprint of the Eixample, and combining it with main urban connections that cross the city on the mountain-to-sea axis (often linked to the old footprint of the water streams on their way to the sea), we identify main points of “discharge” of people and activity, that we will work with to define the hubs. Each of these intersection points will be strategic and well thought connectors that will not only be stitching into a linear line and give a new definition of La Ronda Litoral, but also be important nodes that connect the perpendicular grid taking us from the sea to the mountains and beyond. This hub will be located where the Ronda Litoral divides an industrial area on one side of la Ronda from a mixed use on the other, including a logistics area and the port premises. Using the existing redundant rail tracks space, it will invent a new space, a gateway to a reconquered industrial port, that will host new cultural activities that can co-exist with the activities of the port itself. The hub is located where the mountain meets the tip of the industrial port. At that point a railway station for goods transportation is placed. 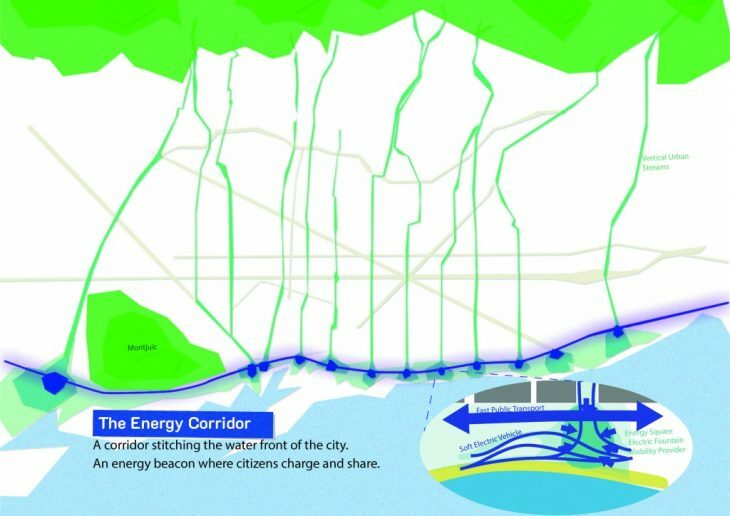 This hub will connect the mountain of Montjuic to the water front, the entrance to the port and the old town, acting as an energy beacon to attract activity and structure a tricky node. On one side, the most dense and oldest part of the city presses against Les Rondes, that are only half sunk at this stretch. At the other side, the port sits only a few meters away, with the old peer “Moll de la fusta” clamped between the fast lanes and the water. In here, the hub will simply invade the excessive lanes on the surface to merge the pedestrian platform of the old town to the now deserted strip that is the Moll de la Fusta, relegating the cars to the 4 underground lanes. The newer city sits on the inside. Les rondes flow underground as a moat dividing the city on one side, and 8 traffic lanes, a linear park and the beach on the other. This Hub will provide a floating square where charging your vehicle, renting one, leaving one will be activities scattered around it, creating a multiuse flexible urban square above les rondes. This energy corridor will be completed by a new Electric Fast Public Transport allocated in the Rondes lanes but that will load and unload passengers on each of the hubs described.